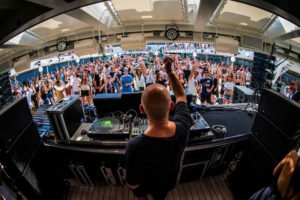 After making a big splash with their first edition last year, underground rave at sea MDRNTY Cruise is back in 2018. Setting sail from Genoa in June 10th, the cruise takes in Sardinia and Corsica before heading back to Genoa on the 13th, with more than 50 acts playing in all. Music is promised to play for 24 hours straight on board the vast MSC Opera, which will be decked out with artistic and technological shows, pop up events, film and documentary screenings, yoga soundtracked by guest DJs, art exhibitions and a world of sport and leisure options including casinos, bowling alleys, swimming pools, multiple restaurants and tennis courts. The first wave of names announced to headline the event are Ricardo Villalobos, Black Coffee, Stephan Bodzin, Jan Blomqvist, Apollonia, Culoe De Song, Behrouz, Patrice Baumel, Andrey Pushkarev, Audiofly, Eagles and Butterflies, Matthew Dekay, SIT, Hyenah, Osunlade and Ion Ludwig. Ticket prices include unlimited non-premium drinks, access to all facilities and a share of a quadruple room, all for €689.